Despite my editorial schedule, occasionally events/ideas come to light, and which create a need to depart from that schedule. To post Three Things for which you are Grateful. To post three things you are grateful for, for Five days. Then to challenge Three other people to do the same. Mike did not challenge me personally to do this, but I saw an opportunity, and I am taking it. I am grateful for my parents, for it is through their guidance and trust, that I am who I am. I am grateful for my wife, as she brought me back to God; she also gave me my children. I am grateful for all of my trials and tribulations, for they have helped me to see the best things in Life. Rather than challenge three people to do the same, I would like to challenge all of my friends and readers to do the same. Life constantly reminds us of all our problems, and those of others. Every day we wake up to the news telling us about war, famine, crime, drought, earthquakes, and much more. These are truly horrible things. And every day, people endure these catastrophe’s with honor and dignity; many who know that despite their trials, others have it far worse. I will continue posting Day 2 through 5 on Facebook. 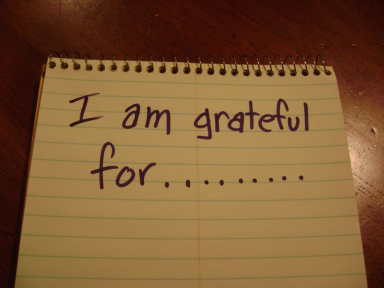 I challenge you to also post your three things you are most grateful for on Facebook also. Please try to tag me on your post, so that I can compile a list of everyone’s three things they are grateful for – and can later share the consolidated list.